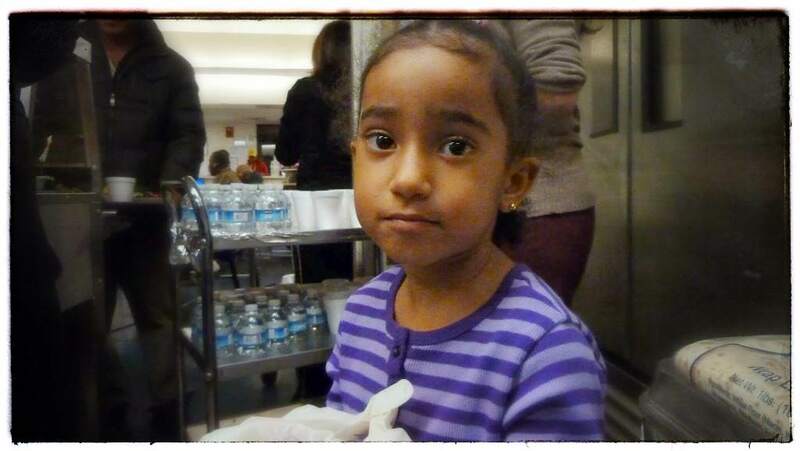 About one year ago, I was fortunate enough to have my 4 year old niece join me at one of our shelter dinners. I don’t think she had any idea of what she was getting into, but rather was just happy to go somewhere with “Utie”. On the ride to the shelter I explained to her where we were going and what we were going to do. I explained to her that we were going to help people that didn’t have a home. People that have had bad luck. She heard me and we talked about it all, but I don’t think any of it sunk in until she actually saw it. A few minutes after we arrived she was busied with the volunteers asking her about herself and didn’t think about the homeless. Pretty soon, though, it was time to get to work. Desiree Mehbod assigned her to assist with drinks. This was the most fitting position for her due to her age and height!!! As the dinner service began, she was focused and worked hard at helping hand out bottles of water and cups of juice. She focused and worked hard for the whole time we were there…. And I even think she enjoyed it! At the end, the volunteers spent a few minutes chatting and taking pictures – being a little ham, she loved this part very much. On the drive home we talked about her experience and what she thought. True to her age, she just said it was “fun” – whatever that means to a four year old. When we arrived at our home, she told her parents that she helped the homeless… “That means people without a home.” She told them that she was very helpful and the big people there told her she did a good job. That was the end of her experience as far as anyone was concerned. I tried several times after this day to talk to her about the memory of the day and how she felt… but I didn’t get any real feedback from her. This past October, Lexi turned five! She was excited and happy. I had the great pleasure of being invited to her “girls only” slumber party…. Even though she was kind enough to allow me to bring along my 1 year old son! As she and her eight 5-year old friends played, blew out candles and opened presents, Lexi decided to give a little Thank You speech. In her speech she said that she was thankful for her friends and all the fun they are going to have tonight. She thanked her mommy for the great party and me for flying all the way down on an airplane to see her (she lives in the Virgin Islands). Then, she thanked her parents for the beautiful room she has. I thought all this was cute and adorable… little did I know that it had more meaning behind it. The next morning as we ate breakfast (with a very loud and excited group of little girls), Lexi decided to share her “people with no home” story with her friends. She told them about what she did… stopping every two sentences to say “right Utie”? She told them about how SHE served them drinks and about how they live in this building that looks like a school with no back yard and no play area. This touched me so much, but not as much as what happened on the phone a few weeks later…..
Of all the things I ever wish to teach children, I think Lexi received the best lesson of all. I know now that because of one little experience, this child will always take care of others when she can. Hopefully she’ll have a better concept of money later in life ($500 for water!!! ), but I think the point was made! Thank you to all of our wonderful volunteers that give so much to “the people with no home.” I hope that each of us is able to make a small, tiny, positive difference in someone else’s life that can be with them forever.